A great American President, whose life had spanned almost an entire century, has died. Ronald Wilson Reagan has now 'gone beyond the surly bonds of earth, extending his hand to touch the face of God.' Reagan had spoken for the last time to the American people nearly a decade ago saying farewell, as he began his final journey into the sunset. In his final days, he had totally failed to recognize anyone, even his beloved Nancy, as a result of the rampages of Alzheimer's disease. The last five days of his life he had not even opened his eyes. Life had all but escaped his body, when the family members summoned everyone to be with him when he drew his last breath. Nancy held her beloved Ronnie's hand and ran her fingers through his hair. The gentle President took a breath and unexpectedly opened his eyes, directly looking into Nancy's eyes. There was a sense of recognition in his eyes and a hint of a smile on his lips. Then he deeply exhaled and closed his eyes for the last time. 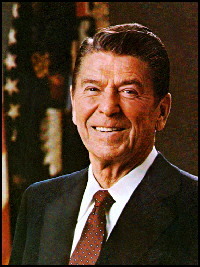 Reagan's death, though expected has dealt a blow to his admirers. There is a deep sense of loss and thousands of people have waited for hours to pay their respects, as the flag draped casket is open to the public for viewing. An elaborate public funeral was planned by the family. A horse driven carriage with the casket draped in the US flag, was led by a riderless horse to signify the final journey of this remarkable man. There is emotional, spontaneous outpouring of adulation and love to this good and decent man, as witnessed by the people waiting for hours to pay their respects to him.